Winter flowering honeysuckle is a great shrub for the border. Delicate creamy flowers with a wonderful perfume, are born in clusters on bare stems from January to March. Excellent as a border shrub or hedging plant, winter flowering honeysuckle will reach a Height: 2m (78″). Spread: 2.5m (98″) and will thrive in sun or partial shade. This plant is a real joy in the garden when nothing else much is flowering and is an early source of nectar for early bees and insects. After flowering, the shrub produces small green leaves which render it fairly insignificant later in the year, so it is best planted with other shrubs that will have more interest in the summer. 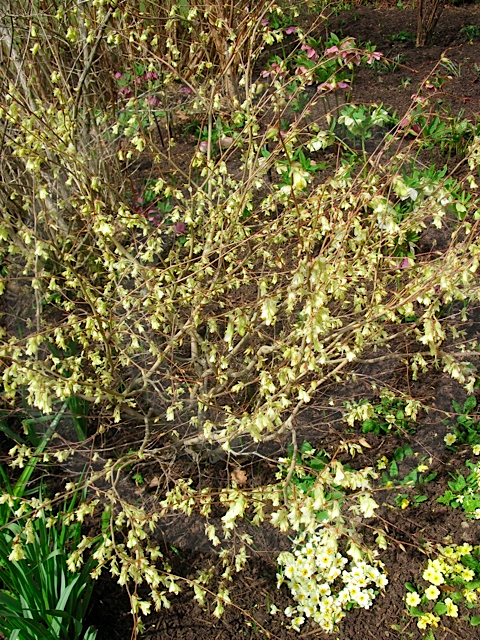 Winter flowering honeysuckle can be pruned after flowering by removing about one third of the flowering stems. It will appreciate a generous mulch around the plant base of well rotted manure or garden compost. We purchased our winter flowering honeysuckle from Van Meuwen as a bare root plant but they can be purchased potted. Our main reason for buying bare root, smaller plants, is our situation in the North of Cumbria. We find that these types of plants adapt better to the conditions as they grow.